Fluke is a beautiful story based on a combination of real events relating to southern right whales in Sydney Harbour. It depicts the excitement and interest people have in the prospect of seeing southern right whales during their migration to warmer waters. 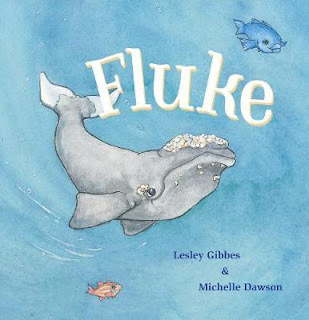 Fluke is a story that young children can relate to. It expresses the feeling of joy at the time of a new birth but it also shows the gamete of emotions that everyone feels when a child is lost and then found. The story begins with the exciting event of a calf, Fluke, being "...born under the shadow of the great harbour bridge." Like all new babies, Fluke is cradled by his mother and soothed by her voice, her whale song. Once the whales are spotted, excitement increases in the city, with crowds gathering on the shore to watch the baby whale playfully slap his tail and spy hopping. Author, Lesley Gibbes, then changes the mood of the story, the boat engine roars and churns the water, frightening the little whale. Fluke becomes separated from his mother. The illustrations by Michelle Dawson add to this mood by removing the little line at the edge of the whales mouth turning a smile into a sad face. The technique of telling this part of the story from a variety of perspectives depicts the range of emotions shown by the characters. Fluke is frightened. The mother worried as she cannot find her baby. While the people are concerned for the baby whale's well being and contribute in the search to reunite the calf and mother. The result of the search is very pleasing, it delivers a happily ever after. Lesley's expertly uses words that help the readers connect emotionally with the story. Be prepared for a roller coaster ride of emotions, from soothing and safe, to excitement, then fear and joy. The story's rhythm makes it easy to read out loud, even when the story's pace changes. Michelle's watercolour and pen illustrations show the largeness of the whales by painting them stretched across two pages. The water of the harbour is painted using a variety of techniques that gives the water depth, a 3D quality. She has used sea sponges to create amazing textures on the whale's skin. There is also a delightful inclusion of other harbour sea creatures eg. fishes and turtles. There are whale facts cleverly woven into Fluke's story and an additional 37 facts about right whales on the end papers. Other stories by Lesley Gibbes are Quick as A Wink, Fairy Pink and Scary Night. Illustrator Michelle Dawson has previously illustrated the book Let's Go to Sleep by Margaret Wild.